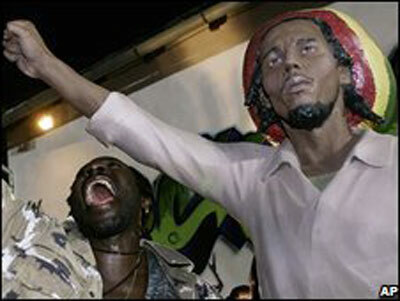 A Jamaican musician celebrates the statue’s unveiling. A statue of late reggae legend Bob Marley has been unveiled in a small Serbian village during a rock festival as a token of peace in the Balkans. Musicians from Croatia and Serbia were joined by rock fans for the midnight ceremony in Banatski Sokolac. Organisers said Marley, who died in 1981, “promoted peace and tolerance in his music”. Serbia recently erected a statue of iconic film character Rocky, while Mostar in Bosnia has one of Bruce Lee. Another Serbian village put up a statue to actor Johnny Weissmuller, best known for his depiction of Tarzan. Serbian musician Jovan Matic and veteran Croatian rock star Dado Topic took the covers off the Marley statue at the Rock Village event. It depicts him holding a guitar, with his fist raised in a defiant pose. Organisers claim that the Marley statue, which was created by Croatian artist Davor Dukic, is the first monument in Europe to the Jamaican-born star. Bosnia’s bronze statue of Bruce Lee, erected in 2005, was seen as a symbol against ethnic divisions deepened by the country’s fierce civil war in the 1990s. The Serbian village of Zitiste put up a statue to Rocky – played by Sylvester Stallone – last year in a bid to shake off a run of bad luck. A series of floods and landslides had led some people to believe the village was jinxed.